The Groningen Protocol: A system/process for euthanizing seriously ill newborns. My blogger friend Marlin Huston (A Time For Choosing) posted on this subject in December. The Protocol has the appeal of ending the suffering of seriously ill newborns, as the story excerpted below relates, but it also opens the door to more widespread euthanasia of seriously ill people of any age, and even people just because they are old, perhaps. Already in the Netherlands the procedure may be used on children up to 12 years of age. It is a good time to examine the furthest extreme to which this process may eventually reach, and to ask how long it will be before committees of physicians will be able to decide who lives and who dies, and under what circumstances. Euthanizing terminally ill newborns, while still very rare, is more common in the Netherlands than was believed when the startling practice was reported a few months ago -- and experts say it also occurs, quietly, in other countries. Dutch doctors estimate that at least five newborn mercy killings occur for every one reported in that country, which has allowed euthanasia for competent adults since 1985. In 2002, doctors at University Medical Center Groningen helped create the so-called Groningen protocol, a list of standards for performing and reporting euthanasia of newborns with serious, incurable deformities. The aim was to encourage more reporting and discussion. The Groningen protocol requires being sure that the newborn is suffering greatly with no hope of improvement, that the prognosis is certain and confirmed by at least one independent doctor, and that both parents give informed consent. Two pediatricians at the hospital, Drs. Pieter J.J. Sauer and Eduard Verhagen, report in Thursday's New England Journal of Medicine that 22 mercy killings of newborns who otherwise would have lingered in intensive care for years were reported to authorities from 1997 to 2004, about three each year. 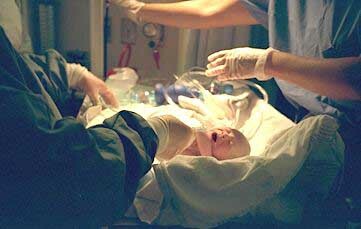 But national surveys of Dutch doctors have found 15 to 20 such cases a year, out of about 200,000 births. Verhagen, who supports such euthanasia, said in an interview the doctors were allowed to review district attorneys' records on the 22 reported cases. None was prosecuted. "These were all very clear and very extreme cases," he said, where the newborns were suffering from severe, untreatable spina bifida, with major brain and spinal cord deformities and sometimes other birth defects. "Do we have them continue life in suffering or do we end the life and end the suffering?" Euthanasia opponents and others have been highly critical of that viewpoint. "During the past few months, the international press has been full of blood-chilling accounts and misunderstandings concerning this protocol," the doctors wrote in the journal. Details of the newborn's condition and the euthanasia procedure, usually an infusion of lethal drugs, must be reported to local district attorneys under the protocol, so they can assess each case without interrogating physicians. "We believe that all cases must be reported if the country is to prevent uncontrolled and unjustified euthanasia," the doctors wrote. Where did all the weapons go? What in God's name were they thinking? Senator Robert C. Byrd, D-W.Va.